We have an unfinished basement in our house that is decidedly awesome because, A: it is utterly dry, all the time, B: it is easily the largest single space in our home, C: it has no heat, finished flooring walls or ceiling, so the city’s property taxes ignore it. In an unrelated note, we are getting fat. I don’t know how long you have been married, but I think it’s safe to say buying exercise equipment for your spouse is not a good idea in any marriage that’s been intact for less than a decade. I got away with it because my wife has been asking for a particular product (a Gazelle) for years, and because she thinks if there’s equipment in the house, I will use it as well. And this is true. We had gym memberships for a couple of years which worked out fantastically well for the gym franchise, because they hardly ever saw us. Especially me. I bike to work and am allowed to argue that this is sufficient exercise up until my pants stop fitting. Unfortunately, my pants stopped fitting about a month ago. But I didn’t buy her a Gazelle, because I have the Internet and a little time to do some research and it didn’t sound like a good idea. (When you see “puts you in an unnatural position” coupled with “wobbly” and “no tension adjustment” you’re either reading a description of exercise equipment you shouldn’t buy or a tell-all from Hugh Hefner‘s new wife. Either way, it’s a major caveat emptor moment.) I did get her a sturdy step-machine from Brookstone that I brought her in to try twice before purchasing. And I asked mom to front us some of the cost of a half-decent elliptical as a combined Christmas gift. 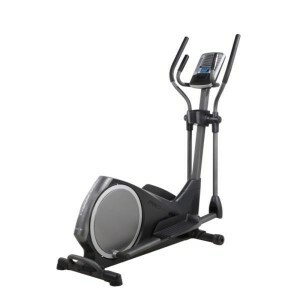 We took a trip out to Natick– also known as the ninth circle of mall hell– on Saturday and came away with a decent, sturdy elliptical that was so heavy son Tim and his friend Michael took turns nearly killing one another in their effort to get it into the house. We also picked up a weight lifting bench that looks like it can hold a lot of clean clothes. And after we cleaned out the basement, moved the couch and chair back to the far end of the room, cleaned some more, cleaned a little bit more, and then shampooed the rug and cleaned some more (did I mention the cat box is down there?) I built our new toys. Let me just say that while I have suggested (above) that I am getting fat, I am not deeply, profoundly fat or severely out of shape per se. I can’t even imagine what it must be like for someone who is desperately out of shape– someone who needs these products more than I do– to build either of these things themselves. Here’s the thing: when I build something at home, that something generally came from IKEA, and the great thing about IKEA is that everything you need comes in the box and the name of the products are actually Scandinavian curse words. So even though the end result is a crappy pressed-wood fern stand we didn’t need in the first place, I didn’t need to bring anything extra to the process. This is not to say I don’t own tools. I do. I keep them scattered throughout our home where I can always find them when I don’t need them. I’m just not very good at USING them. That’s what I did last night. And today I can barely move, which is okay because I can’t start working out until I get over the flu. And I am looking forward to being able to work out down there. Historically, our evenings involve us watching one or two shows from the DVR before either dithering about watching a third show or my disappearing to get some writing done. Now, we can watch those one or two shows while also getting in an aerobic workout. (Aside: we already own a recumbent exercise bike, if you’re wondering whether we are both planning to stand on the elliptical at the same time.) That’s the idea, at least. And it might even work. Until then, I have to buy some D size batteries, and maybe try to figure out what the rubber hammer was supposed to be for. The rubber hammer is for beating your thumbs, because it hurts less than trying to figure out the instructions. Well that explains that last diagram in the manual. Way to jump the gun on Hugh there. He just proposed, he didn’t get married. I would love to feature an excerpt from your book on my blog 500 Words. It’s free. Just send me 500 words from anywhere in the book. (It’s nice if it’s different from the sample offered on Amazon.) You can also send me anything else you’d like to post with the excerpt – author bio, blurb, artwork, etc. I will link to your book’s Amazon page, blog, etsy store or any other site you’d like to promote. If you’re interested, let me know, if not, no problem.